HHL Architects was commissioned to investigate the cause of rapid deterioration of the gold leaf on the M&T Dome. The building, topped by a glazed terra cotta dome, was originally designed for the Buffalo Savings Bank by Green & Wicks, and opened in March of 1901. The glaze quickly deteriorated and was painted with aluminum..
Gowanda’s Historic Hollywood Theater is a New York State and National Historic Registry Landmark. In 1997, the theater was donated to the Gowanda Area Redevelopment Corporation (GARC), a non-profit organization. In 1999 the GARC chose HHL Architects to lead the theater’s restoration project, which would be broken down into two phases. Phase I included design.. Located in the historic West Side Buffalo neighborhood, the Niagara Gateway Apartments project aims to salvage and adaptively reuse the 75,000 square foot century-old, historic former Buffalo Milk Company manufacturing building into 53 affordable apartments along with Niagara Street-facing ground floor commercial community space. The proposed mixed-use project reconstitutes the original four masonry and heavy.. Constructed in 1905, our investigation of the east stair determined the cause of shifting and cracking to be deteriorating foundation walls resulting from water infiltration. Following the investigative study of the foundation’s condition, the first action was to disassemble the stair, numbering and stockpiling on site the reusable granite and marble treads. Veneer granite on.. Following the successful 2013 West End Modernization project, the Park Country Club determined that a complete renovation of the men’s and women’s locker rooms was necessary. The men’s card room was expanded in size to suit member demand. A women’s card room/lounge area was carved out of the modest footprint. The 600+ oak lockers in.. In 2011, HHL was commissioned to prepare a design study for potential expansion and renovations to The Park Country Club main clubhouse. The study presented a proposed 5,300 square foot addition and interior renovations to the 1927-built English Scholastic Style Clubhouse. The club’s desire was for increased casual dining/bar space and capacity. 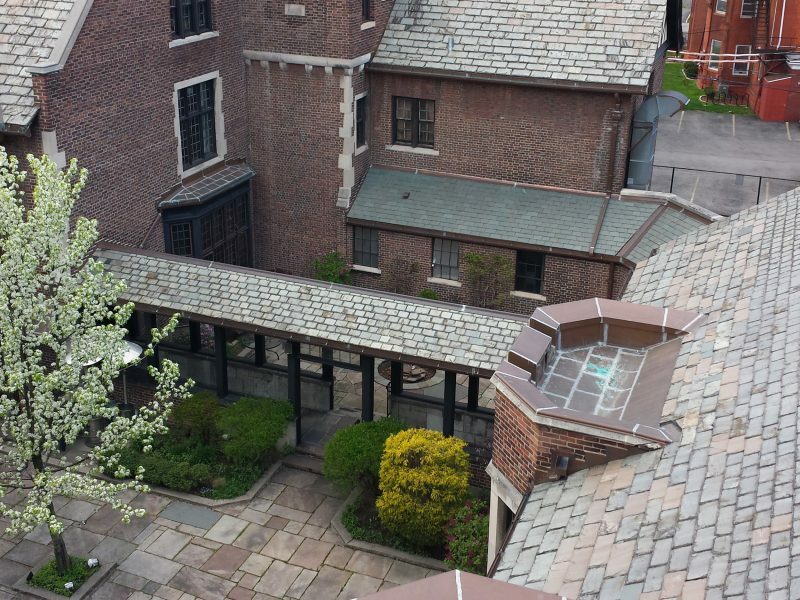 The HHL design..
HHL designed the complete restoration of the Vermont slate roofs and flat roofs of the Saturn Club, a private member-only club in downtown Buffalo, NY. The facility is listed on the National Register of Historic Places by the US National Park Service and is a contributing property in Buffalo’s Linwood Historic District. Designed by renowned..